Growth Habit: This vigorous vine uses tendrils to twine its way over low growing vegetation and up the trunks of trees. It can produce massive amounts of dense growth that can dominate and shade out other plants. The three lobed leaves are soft and downy. The plant does not do well in cold conditions. In Tasmania during winter, it survives within the canopies of other plants. Exposed stems and leaves are damaged by frosts. It appears to do better in the more moderate coastal environments. Type of Plant: Evergreen climber. 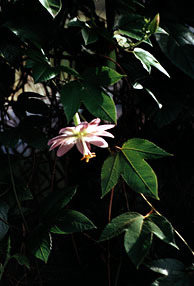 Flowers: Large pale pink flowers up to 8cms across typically hanging downwards. Fruit/Seed: Large banana shaped fruits, turning from green to yellow as they ripen in late summer and early winter. Dispersal: Seeds spread by birds and possibly possums and other native mammals. The fruit is eaten by the animals and the seed can pass out at some distance from the parent plant. The vines can put down roots where they are in contact with the soil. The dumping of garden rubbish in the bush contributes significantly to the spread of this weed. Distribution: Banana passionfruit was planted widely in the past before better cultivars of black passionfruit were widely available. Its range in Tasmania seems to be limited because of its sensitivity to cold. Status: This plant is not a Declared Weed in Tasmania. However its history as a very invasive weed in similar climatic conditions in Victoria and New Zealand suggest that there is cause for concern. This plant can cause severe local weed problems because of its vigorous growth. Large infestations can smother trees, but this appears to be rare. It is the large volume of leaf and stem matter that make this weed difficult to clean up. This plant is now rarely sold as a fruiting variety, but it is still used as a screening plant because of its prolific growth. More productive fruiting varieties of passionfruit are often grafted on to banana passionfruit root stock. Disease of the fruiting variety or cultivating too near the roots of such plants can trigger off a mass of suckers from the root stock which can quickly dominate the preferred variety. Many problems with this plant are due to illegal dumping of garden refuse in the bush. Similar Plants: The vigour, flower colour and the shape and colour of the fruit distinguish this passionfruit variety from the better producers of fruit now available. For more information on Passionfruit, contact the Department of Primary Industries and Fisheries or your local Council. Grubbing (all year). All above ground parts can be manually removed and burnt. The crown and root system can then be grubbed with a mattock or similar tool. Herbicide (spring and summer). Small plants may be sprayed with glyphosate or metsulfuron, however care must be taken as these herbicides may cause significant damage to surrounding vegetation. In areas of heavy bush the cut stump technique is generally a safer option suitable for larger plants. All stems must be treated.